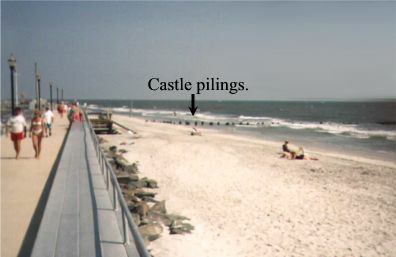 Brigantine Castle burnt to the ground on September 26th, 1987. Nothing remains of the structure except some burnt pilings that can be seen along the beach at 14th Street North. Because the attraction had been closed for about three years before the fire, many of the props and furnishings of the castle had been removed by castle employees or stolen by island teenagers. If you travel around Brigantine, you may run across some of the pillaged memorabilia. The castle pier parking lot had several lights with cement bases that were covered in the same imitation stone as the lower walls of the castle. The lights were removed a long time ago, but the cement bases with stone covering survived until 2003. The bases were finally removed to make room for new housing. 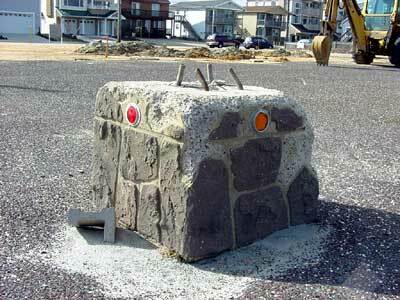 One of the light bases from the Brigantine Castle parking lot in 2002. The imitation stone coverings on these bases were the same that was used on the lower castle walls. These bases survived into the new millennium, but were recently removed to make room for new housing. 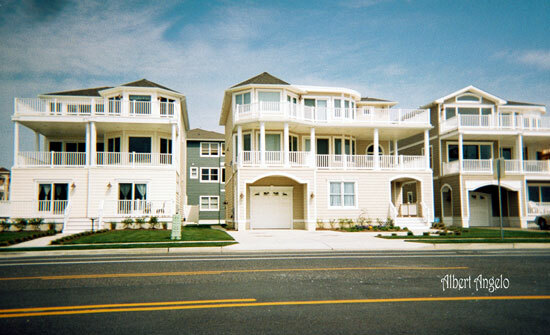 A picture of the new condos on the former location of the Brigantine Castle parking lot. This picture was sent to us by Albert Angelo. Although the structure no longer exists, Brigantine Castle is still alive in the minds of the actors that once worked there. Since 1992, many of the original actors have regularly gotten together around Halloween to host haunted houses in various locations. The most recent of these performances was in October of 1999 at Surf's Sandcastle stadium in Atlantic City, NJ. For this performance, 15 of the original 30 Brigantine Castle cast members reunited to produce what was titled, the Haunted Castle and Field of Screams. We will keep this page updated as to when and where Brigantine Castle reunions will be held. If you are in the Brigantine area, and you are looking for information about the castle, you should stop by the Brigantine Beach Historical Museum on 3607 Brigantine Boulevard. 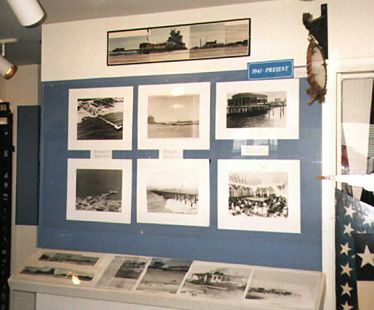 There is a display devoted to the Brigantine Castle pier. You can call the museum at (609) 266-9339 to check for operating hours. Another good place to gather information about the castle is the Atlantic County Library on 1500 W. Brigantine Avenue. The library has a folder in their vertical file devoted to the castle. You can call the library at (609) 266-0110 to check for operating hours, or visit their website. If you visit the castle pier location, you should stop for a bite to eat at the Pirate's Den. This restaurant, which is located directly across from where the castle once stood, has a small display devoted to the castle and the castle pier. According to former Brigantine Pier arcade worker, Rob Curtis, this restaurant was called Jan's Snacks and Sundaes when the castle was open. The food at this diner style restaurant is pretty good and the prices are reasonable. It is open year round and can be contacted at 609-266-1927 for operating hours. 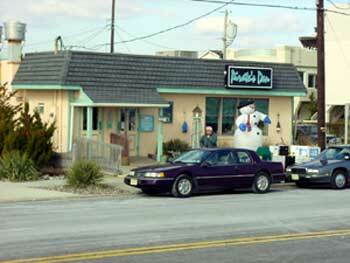 The Pirate's Den restaurant, located across from where Brigantine Castle once stood. They have a small Brigantine Castle display as you enter the restaurant.